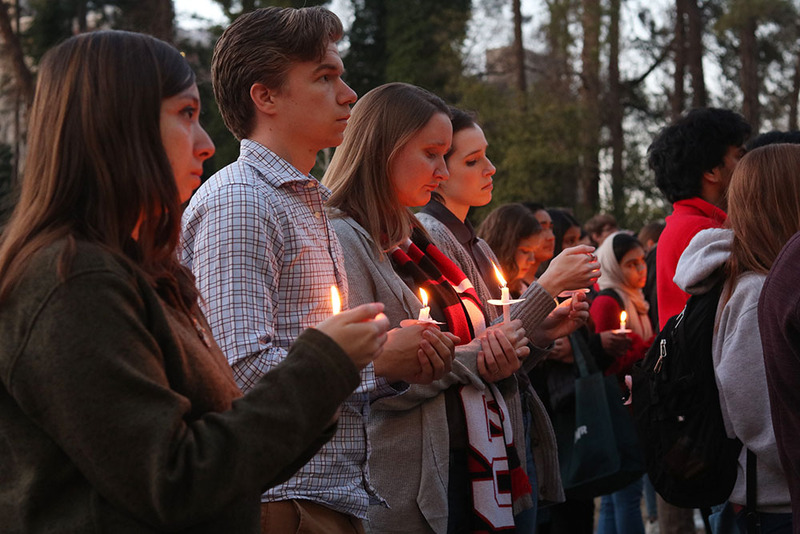 Kevin Singer, a graduate student and co-director of Neighborly Faith, speaks at vigil for the victims of the shooting in New Zealand held at Stafford Commons on Tuesday, March 19. On Mar. 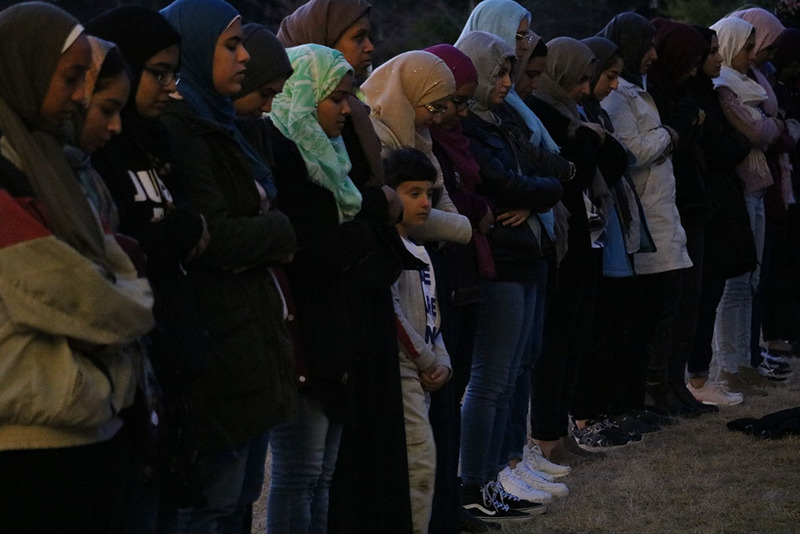 19, over 120 people gathered at Stafford Commons to attend the Community Interfaith Vigil, an event organized by the Muslim Student Association (MSA) to honor the lives lost and affected by the Christchurch mosque shootings and to create a space in which different communities of faith could stand together in solidarity. Mohsen Zakaib, a third-year studying nuclear engineering, physics and anthropology, is the president of MSA, and said the MSA put the event together in one to two days. Zakaib began the vigil with an acknowledgment of strength in solidarity. 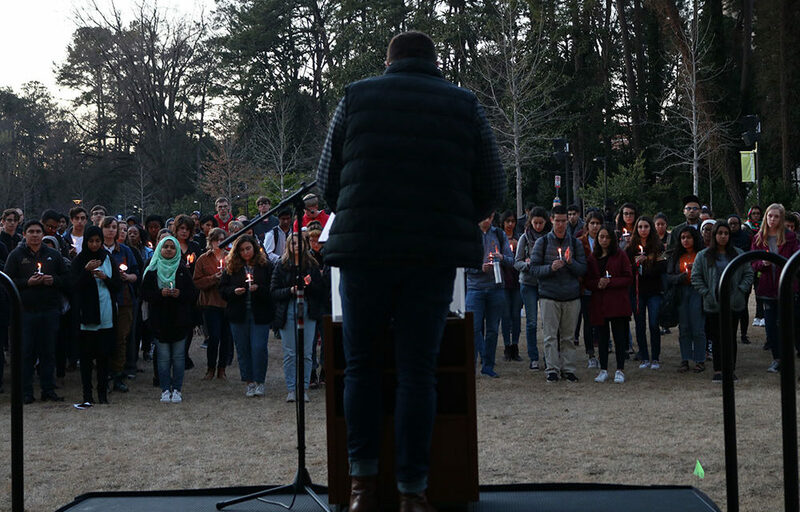 Eleven speakers—ranging from NC State students to the NC Senator of district 38, Mujtaba Mohammed—contributed their words of perseverance against these attacks, support for the Muslim community and hopeful visions for the future. “We should be building tables instead of building walls,” Mohammed said. Interfaith support was voiced by various speakers, like Rabbi Melissa Simon, the senior Jewish educator and rabbi at UNC-Chapel Hill, and Kevin Singer, co-director of Neighborly Faith, an organization dedicated to helping evangelical Christians accept and engage with people of other faiths. NC State faculty and staff members like Justine Hollingshead, the assistant vice chancellor of academic and student affairs, and Lt. Timothy Hammonds from the NC State University Police Department, extended NC State’s support and highlighted useful campus resources for ensuring personal and community safety. Midway through the vigil, time was reserved for the Maghrib prayer, the Muslim prayer just after sunset. At the end, a moment of silence was held for the victims of the shooting. She also felt the vigil was helpful to people like her who needed to process the shooting and acknowledge their desensitization to such tragedies. Shehata added, “Being able to be at this vigil and feel safe to perform your own prayers also creates a channel of support between allies and Muslims. People learn more.